The new Museum housed in a renovated sawmill has been entirely redesigned, focussing on the Regole d'Ampezzo, the century old common heritage of the Cortina d'Ampezzo valley. The exhibition develops on two floors in the upper part of the building. On the first floor, the collective institution of the Regole d'Ampezzo and on the second floor the common heritage of the Regole and the collective management of forests and pasturelands. In the basement, the space has been designed to house themed exhibitions, the precious collections of traditional arts and crafts - tarsia works, silver filigree, wrought iron and traditional costumes. On the same floor there is a teaching classroom. The scope of the exhibition is: to focus the attention of the visitors on the ancient decisions and choices that formed the forests and pasturelands that we admire today; to help visitors understand that over the centuries the collective management of the common heritage has been the main source of sustenance for the Ampezzo community; and finally to show that this ancient institution is still successfully functioning in our times. 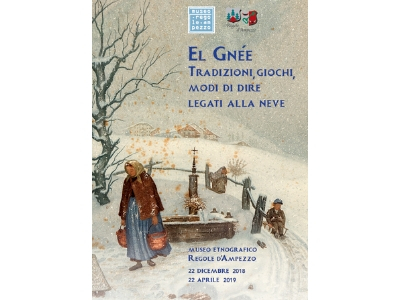 Through a selection of objects and images the museum documents important cultural aspects of the Ampezzo community: the heritage of traditions and customs, the management of forests and pasturelands, and the century-old relationship of Man with the natural environment. The Museum is close. Reopening on June 2019. On subscribing to our Newletter, you are asked to provide your first name, family name, and your email address. Direct Marketing activities: we utilize your email address to deliver information on our initiatives and cultural activities. For a communication tailored on your personal interests we ask you whether you wish to be informed on all our activities or only the ones concerning a single museum. Regole will require your consent before processing your personal data for direct marketing purposes. - The right to object: at any time you may object to the processing of your personal data for direct marketing purposes (Point B of this Policy) . In this case your personal data will no longer be processed for these purposes. Should you decide to exercise this right, please let us know whether you mean/want to delete your personal data or restrict their processing.